I am pleased to share this treatment manual, impACT: Motivational Interviewing/Acceptance Commitment Training for Adolescents with Substance Use and Co-occurring Problems. It is yours, free for the download. Though this is a guide for therapists, impACT could help a wide array of people wanting to support and treat youth and families struggling with adolescent substance use. This approach to treatment of adolescents who have substance use and co-occurring mental health problems has been years in the making. It is groundbreaking because ImpACT was developed by clinicians and researchers who worked with significant input from adolescents. Such collaboration is extraordinary — and also makes it much more feasible to implement ImpACT in real-world settings, such as the hospitals and school-based clinics where I work. And that’s what we need: effective treatments rooted in sound science that can be applied in the real world. Why does the world need another adolescent substance treatment manual? First, it’s important to understand that most evidence-based treatments — meaning those supported by sound, robust and peer-reviewed research — do not make it to the real world (Miller et al., 2006). Why? In many cases, these treatments were developed by researchers for research. So, while they might be great for getting specific questions answered and advancing our understanding of science, they may be too inflexible or too limited to carry out in actual clinical settings, where people who need treatment present with far more complex and fluid problems and life dynamics than the treatment model can adequately address. Second, most behavioral interventions help only about 25 percent of youth achieve a month of abstinence from substance use (Dennis et al., 2004). Even if you combine such interventions with rewards for negative drug screens, only 50 percent of youth achieve short-term abstinence. These outcomes suggest significant need for new approaches in the field of adolescent substance use disorders. Third, there are few treatments that help young people who have both substance use and co-occurring mental health problems (Hawkins, 2009). This is especially unfortunate because the vast majority of young people — at least 80 percent — who present for substance addiction treatment, also present with co-occurring psychological concerns (Dennis et al., 2004). What evidence suggests this treatment is helpful? Motivational Interviewing (MI), which is recognized by the Substance Abuse and Mental Health Adminstration (SAMHSA) as an evidence-based practice for substance use treatment. A recent PubMed search shows 1,114 randomized, controlled trials of MI. Given how widely MI is researched and applied, impACT allows for as many MI sessions as are needed and incorporates the spirit of MI throughout. Acceptance Commitment Training (ACT), which also is recognized by SAMHSA as an evidence-based practice. ACT focuses on promoting general mental health and wellness. 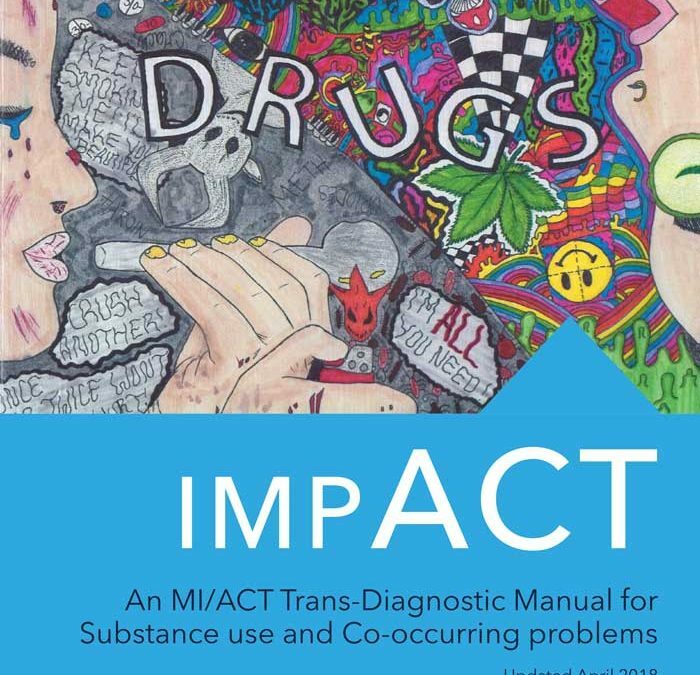 Several randomized, controlled trials demonstrate trans-diagnostic efficacy of ACT for substance use and co-occurring disorders (Brown et al., 2013; Jones et al., 2015; Lanza et al., 2014; Villagrá Lanza et al., 2013; Litvin et al., 2012; Luoma et al., 2012; Smout et al., 2010; Stein et al., 2015; Stotts et al., 2012; Thesiko et al., 2015). Contingency management, an evidence-based practice for adolescent addiction treatment that rewards youth for demonstrating desired behavior, including abstinence from substances (Stanger and Budney, 2010). The so-called “fishbowl approach” used in impACT allows qualifying youth to try to win prizes for good outcomes — and it is both effective and cost-effective because there is not a payout with each drawing (Stitzer et al., 2010). Finally, we are meticulously tracking our results and have published initial findings (Thurstone et al., 2017). We will have more results published soon — which is why I am seeking limited contact information in exchange for the free download of this training manual. Information shared with DrThurstone.com will not be shared with anyone else. You simply may receive an email alert when there is new information to share, and you will be able to unsubscribe from an email list at any time. What is unique about impACT? This treatment uses Acceptance and Commitment Training (ACT), which is a novel approach to adolescent substance use and related problems. This emerging approach is growing in popularity with clinicians and researchers (Hayes et al., 2012). This treatment is developed by clinicians, researchers and adolescents. Academic researchers with specific questions and know-how regarding the structure of clinical trials teamed with mental health providers who work in the field. Together, they found ways to involve young people and their families, whose insight and input helped them think differently about how to develop new approaches, drop the ones that weren’t working and improve the ones that were. This is truly patient-centered care. This treatment is trans-diagnostic. That is, it can be adapted to address multiple concerns simultaneously. These concerns could include anxiety, depression and trauma in addition to substance use. This treatment is easily adapted to nontraditional settings, such as schools. This flexibility is important because it increases access to care. I currently work alongside talented teams of mental health providers who deliver mental health and addiction treatment in six public high schools in Denver. Our school-based work has significantly informed the development of impACT — and it is all funded in large part by generous philanthropic contributions. Please use the form below to contact me to learn more about school-based mental health care and ways to structure it effectively. I hope you find this manual as helpful as my team members and I have. Please contact me with your feedback. Hayes et al. 2012. Acceptance and Commitment Therapy: The Process and Practice of Mindful Change. The Guilford Press. Stotts et al. 2012. Drug Alcohol Depend 125(3):215-222.